Music Xray Review: Money Maker Or Massive Time Drain? Last updated on October 22, 2018 By Nat 6 Comments This post may contain affiliate links. We appreciate you supporting Rags To Niches! Full disclosure here. Is Music Xray Legit? In my Music Xray review today, I’ll be checking out the whole platform and you can let me know what you think. I heard about Music Xray many months ago and heard it was similar to slice the pie, (another platform that pays to listen to music). Therefore, this review has been a long time coming and I’ve been really intrigued to check out this platform! So, what is Music Xray and can you make money with this platform in 2018? Overall Rating: As a small-time money opportunity, it’s Legit. You won’t earn very much at all though! It’s a cool site to listen to some music and support bands – that’s the real point of this website. In my opinion, this is definitely not a good place to make any kind of money online. Fed up of making peanuts online? You may be interested in this…. What Is Music Xray About? Music Xray is a website for both music artists and music fans. If you are a music artist, you can have your music listened to and reviewed, which can bring you some valuable feedback from listeners. If you’re a music fan, you get to listen to new artists and get a small amount of money for doing so. Since I’m reviewing the make-money-online side of things, I will be specifically focused on this from the perspective as a music fan. 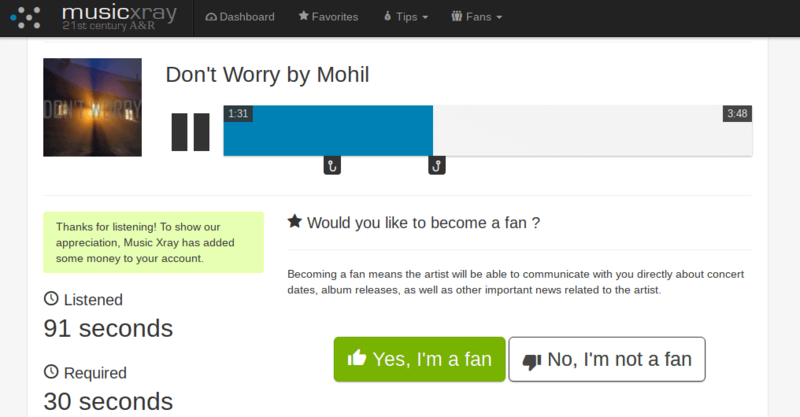 On the homepage of the website, you have the option as signing up as a music fan. You can see this highlighted below. So, as a music fan myself, I clicked on the relevant button and was connected to the video below. So, when you open an account as a fan, you are required to join Fan Match. Where you are asked to let them know as much as possible about your musical tastes. I was surprised to see that I could only select up to five categories of music though. Which narrowed it down for me, as I actually enjoy tonnes of different genres. After this, you’re then allowed to enter up to ten bands that you enjoy. Again, I could have chosen a lot more. Depending on your tastes, (the wider the interests the more songs you could potentially be sent) they predict you’ll only be sent 3 songs per week. This is distinct from slice the pie, which does not go into as much detail regarding your tastes so much. I’ve listened to a huge variety there, not generally my sort of stuff either. But it does make sense to be able to put your music in front of people who are potentially going to be interested in your style. That said, you really should be given more of an opportunity to listen to music than just three songs a week… and that’s certainly not guaranteed. Another difference with Music Xray, is you can become fans to the bands you love, follow them online and keep track of what they’re doing. This is a nice touch for both Music artists and fans, as fans can get to expand their range of music and stay in touch with great bands. Plus Music artists can start building up a fan base from an early point and this can only be a positive move for them. How Much Can You Earn At Music Xray? You earn a minimum of 10 cents per song. But with just 3 songs a week on average being sent to you, this is hardly going to help you out financially. How much do you earn via Music Xray? Let me know in the comments! From what I can see, this isn’t even a pocket money opportunity, let alone anything else. To make matters worse, you need $20 in order to cash out! (As opposed to $10 with Slice The Pie). Payment is via PayPal. And if you’re only making 30 cents per week, it’s going to be a long time coming. There’s another downside, you may not even get paid for the songs you listen to! That is because, they only pay a certain number of potential fans to listen to the song. If you happen to listen to the song after that quota has been filled, you won’t get paid. Therefore, I suggest that you only go down this route in you’re genuinely a big music fan and love the idea of discovering new artists. If you see other reviews online claiming that you can make more money with this program, that’s false info. I saw a review suggest that $10 a day is possible….IT IS NOT! Not in a million years. Even Music Xray themselves say you may potentially be sent three songs per WEEK, not multiple songs per day. Related Post: My Top Extra Income Sites. Alternatively, YOU Can Pay Them! Even though you will be given a little amount for your time, there is also the option to TIP your favourite artists with real money. While this certainly won’t help you, you will be helping support the artists that you’re enjoying and show appreciation. (umm does a virtual burger become a real burger? Is there a coupon… I don’t get it?). Once you’ve filled out all your fan match info, there is then a waiting game – while you wait to be matched with appropriate music for you. It was a couple of days before I was sent music via email – however, if I didn’t go and check it out right away, I’d miss out. You only need to listen to the song for 30 seconds and then you can give the thumbs up or down – so, you don’t have to write a detailed review or anything. The very first song I heard, I also really liked – so it can definitely be a cool way to discover new music. Once I’d listened to the song and given my verdict, I was awarded 10 cents into my inbox. Simple enough, but it’s only 10 cents at the end of the day. How have you found Music Xray? Have you discovered some new music? Please leave me a comment below! Music Xray Review Conclusion: Is It Worth Your Time? I like the idea behind Music Xray, it gives musicians the chance to test out their music, build a fan base and even get tipped in cash. Additionally, if you enjoy discovering new music, this could be a good way to do that. On the flip side though, this really is not any sort of money making opportunity. The fact that you cannot withdraw your money until you reach $20 and with only potentially getting a few songs a week, (if that) means that a MAJORITY of people signing up, will likely give up on it before they withdraw. I can tell you that a MAJORITY of people give up on them very quickly and a mass majority do not take any action trying to make money with them. They realise the money is just not worth it for the most part, or too much effort. The one website where I’ve found people DO take more action, (and still only a minority) is Swagbucks. That’s generally because there are more ways to earn, such as cash back, cash offers and surfing the web online. Even so, that’s still only pocket money we’re talking about. So, while this is a legitimate platform, it’s not something I’d recommend spending much time on if you’re actually looking to make money. Making More Money Online… A Long Term Plan….? To make more of a part-time, or even full-time income online though, it’s a lot more work – but still totally possible for anyone who really wants to make the effort. It’s possible to make money online from something you’re already interested in. That’s how I started online and I learnt completely from scratch. For example, I know several people who have gone into the Music niche, the learning guitar niche, the music related gift niche and many more.. But there are an unlimited number of potential niches that you could get into. From that niche, you can build a business long term and aim to earn a more sustainable income. If you’ve had any experience with Music Xray, or other related programs, I’d love to hear from you! Other posts that you may be interested in…. 14 smartphone apps that can make you money. How to make money from a simple blog or website. I did sign up to a similar website like music x-ray. But I didn’t get any chance to make money from it. By the time I log in to the site after I received an email, I found that the offer has reached the quota of the budget set by the music owners. I wouldn’t put much hope in making money with programs like this. Thanks for your comment and feedback kenny – I have yet to receive any offers!! “I found that the offer has reached the quota of the budget set by the music owners.” Thats a laughable way of musicxray passing the buck. The artist pays a mandatory $10 per song that include 20 reviews. At 10 cents each that is $2 of the $10 spent. Yeah it’s not the artists choosing to limit anything. Heck as far as I know there are no options period. It’s all decided by musicxray. The fees they tack on to submit music makes me not even want to know about this site. Yes, this is what’s happened to me now 99.9% of the time… the song is no longer available, even if I’ve clicked the email immediately after it’s been sent!? It’s not good. They should at least offer people who submit through their site a free kiss. It’s the least they could do after &^%&*& them out of their money. Total BS people. Hey Mike – thanks for your comment. Feel free to elaborate more! What’s your opinion? Thanks, Nat.